Very slightly shimmery dark charcoal/faded black satin matte. Intended to be worn without topcoat. 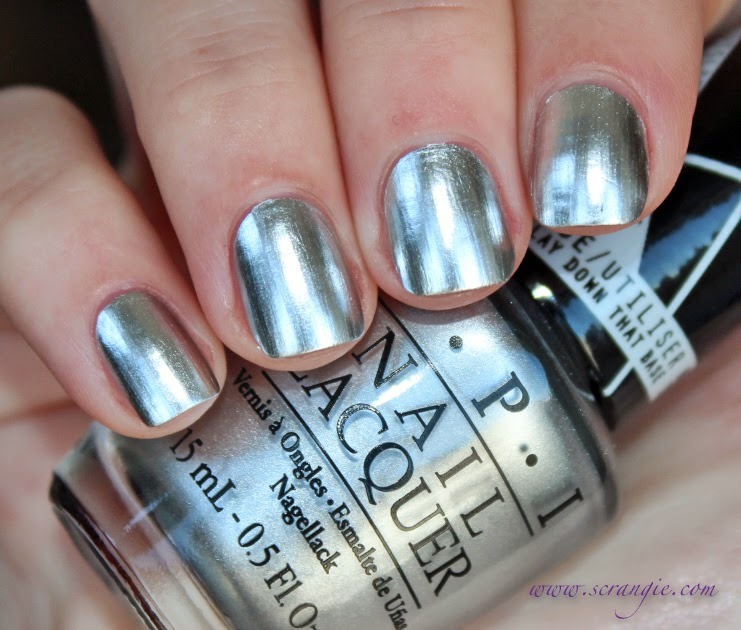 Sparse holographic silver glitter topcoat. Shown here with three coats and still not full coverage. Nice feature of this polish: square glitter. Vampy brown-burgundy creme. Leans more jelly than pure opaque creme. Light gold shimmer with a satin matte finish. Intended to be worn without topcoat, but it looks pretty great with topcoat as well. This is only sold as a set (pictured below) that includes some Swarovski Elements nail art pieces. The color itself is a bright cherry red creamy jelly. This is the special standout in the collection. 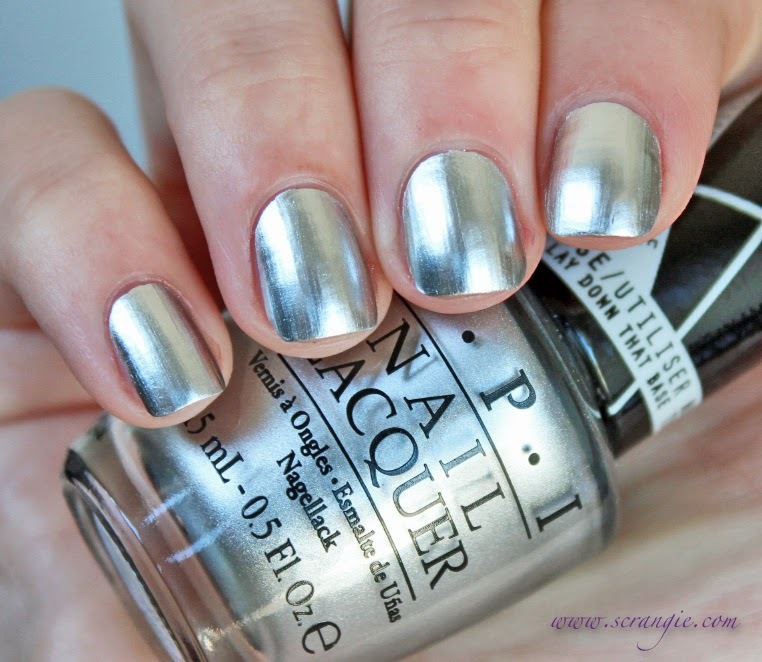 It's a mirrored chrome silver, and without resorting to Minx or other similar nail coverings, it's the most reflective, mirror-like silver out there. It needs to be worn over a special basecoat, but that's included with the polish. The formula on every shade was perfect. Literally nothing to criticize in the texture or application of any of these. Push And Shove can get streaky if you apply the coats too close together or on top of still-wet basecoat, but it's minimal. All shades except In True Stefani Fashion only needed two coats for full coverage (and that's how they're worn here). Push and Shove is very fragile on the nail and doesn't wear for very long. It doesn't chip on me, it actually wears away as if it's being wiped away. Wearing topcoat makes it more durable. Most of the colors in this collection seem too bland to have Gwen Stefani's name on them, don't they? Nothing unique in here except for Push and Shove. It's not a true mirror reflection, but it's the closest I've ever seen. I am completely in love with it. It's even more reflective in person. Only downsides are that it gets damaged easily and that it shows every single flaw on your natural nail (call me Ruffles.) Gently buffing your nails before applying the basecoat should make any ridges or flaws less noticeable. Push and Shove looks very much like the manicure of a robot and I am in constant search for a ROBOT NAILS mani. Thank you!!! I read another blogger's review that Push and Shove chips easily. That's a shame, it's so gorgeous. I swear you are the only person who thought this was a "meh" collection. I personally expected something way more than what they came out with. Like wild colours and glitters mixed with this range. I guess they are good standards but I was only interested in 4 in the Morning because i liked the finish of it (which btw I love). Couldn't agree with you more!! I too expected so much more, but I do love Push and Shove! Thanks for your honesty, Scrangie! So many other bloggers were gushing like crazy over this collection, which is just a pink, a red, a black, a gold and a glitter. They are fine, but nothing to get excited about! Do I need more pink nail polish? No. Do I want that pink nail polish? Hell yes. I did grab a couple for myself and I've actually only tried Hey Baby. For me, it felt kinda thick, but the end result was amazing. would you please do a side by side comparison of the Mariah Carey collection to the Gwen Stefani collection? I am wondering how similar are the vampy burgundy shades, the red shades, and the silvery-gold shades. Thanks! Would you please do a side-by-side comparison of the Mariah Carey and Gwen Stefani collections? I would really like to see how similar the vampy burgundy, red, and silvery gold shades are between the two collections.